Roast vegetables are just so tasty. They really perk up a dish. Add them to wraps, pasta, risotto, as a topping for burgers in a bun or between the layers of a veggie lasagne. This time I've used them to make an Autumnal salad. Lots of beautiful colours and textures tossed through salad leaves and topped with mozzarella pearls and a good drizzling of creamy pesto dressing. Of course I didn't add mozzarella to Graham's salad as he is vegan, but I personally love it in salads. I like adding fresh mozzarella to pasta too, just before serving. Cooper? Well no. He just doesn't want to try mozzarella. He's happy to add it when he's making a pizza, but will he taste it? NO! I don't know why, but he won't budge on it. The only acceptable cheese to him are smoked applewood or cheddar to eat on it's own, veggie style parmesan on pasta and mozzarella cooked on a pizza. Full stop! I couldn't even persuade him how wonderful a delight roasted cheese (cheese on toast) is. Children, sigh! 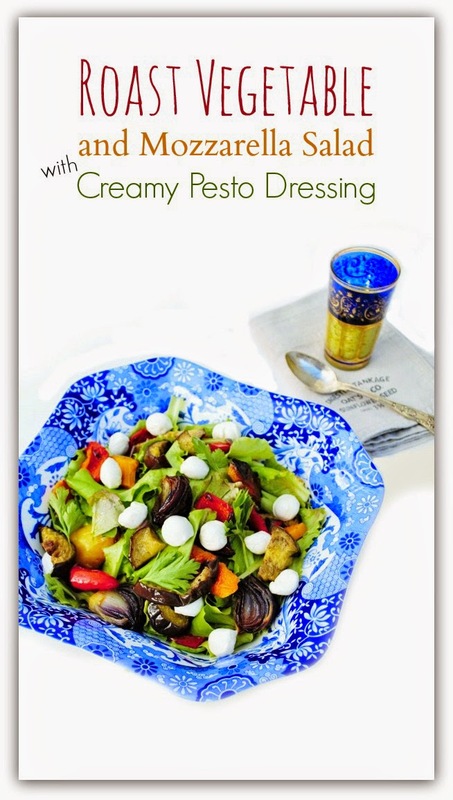 For the dressing I combined pesto, yoghurt, a squeeze of lemon juice and olive oil. Just the right flavour to compliment this salad. Oh now, you may be admiring my salad bowl. I got it some time ago and mentioned it in one of my New in my Kitchen posts. Just in case you are wondering (I know I would be asking), it's a Spode salad bowl. I think it is a thing of beauty, but then I am sad that way. The small Turkish glass I picked up in a cheap shop for pennies years ago, but I think they are quite easy to pick up. I hope you enjoy the salad. A colourful and statisfying salad of roast vegetables on a bed of salad leaves, topped with little mozzarella pearls and a drizzle of creamy pesto dressing. 1. Preheat oven to 220 °C /200°C fan/ gas mark 7.2. Toss all the cut veg in a bowl with the oil.3. Spread the veg out in a roasting pan and cook for 25-30 minutes until the vegetables are soft and charring at the edges.4. Whisk together the pesto, yoghurt, lemon juice and olive oil and season with black pepper.5. 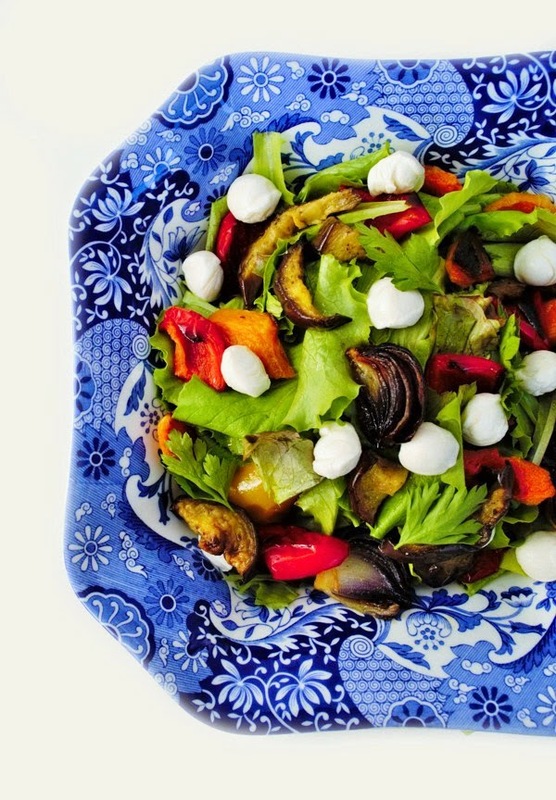 In a large salad bowl, start with a layer of salad leaves, top with the roast veg and then the mozzarella and finish with a drizzle of the dressing. Leave the rest on the table so your guests can add more if they like.6. Enjoy! This sounds wonderful! I love roasted vegetables and I love your pretty dish! I used to LOVE Cheese on Toast when I was wee, the more orange the cheese the better! I'm sure you'll find a way to tempt him to the delights of cheese, although if he's not sold by these beautiful photos I'm not sure he ever will be! Lovely! Haha yes you may be right. I don't understand him at all. Doesn't ike cream on cakes either tsk! Yes mozzarella is a treat. I usually just tear mozzarella, but these look much nicer in a dish. I am sure Cooper will learn to love cheese of all kinds Jacqueline. In the meantime you get to enjoy it in this lovely salad. Hopefully Val. At least he does like some, although Graham may not agree that's a good thing. Salad looks stunning. So summery. It's been ages since I've roasted veg for a salad. Kids are so funny about cheese. I'm sure it's a texture thing. I loved cheese as a kid though. Thank Dom and you may be right about the texture thing. Oh I do love me a roast vegetable salad!! I make a lovely one with a farro base. Am wildly envious of that beautiful plate too! Oh that does sound good Jeanne. Oh no, I would have hated that Cate. That is a shame. Such gorgeous colours, love salads like this but my kids aren't keen on roasted veggies. I will keep trying though as peppers are sweeter I may just stick with them but aubergines…..no way will they touch them! Yes Cooper is selective when I present him with something like this. He would eat the butternut squash, but I'd have to add cucumber, carrot and sweetcorn to his salad, if I wanted him to eat one. Oh yes those are gorgeous when roasted. 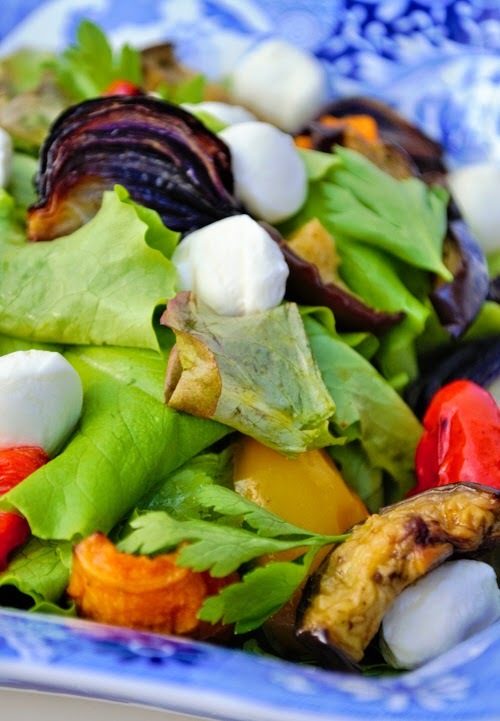 Your salad looks amazing - love the idea of pesto with roast veggies - YUM! Haha, don't think I'll get sick of it.